In Permaculture, ‘Zone 3‘ is generally the area in which seasonal, rain-fed production is implemented. These Zone 3 areas often tend to be the areas in which more staple food production might take place (e.g. 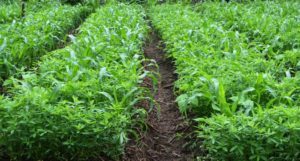 maize, cassava, millet, sorghum, sweet potatoes, etc.) 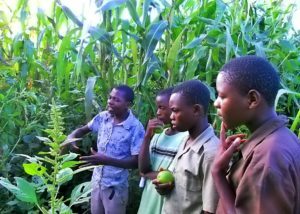 In Malawi, however, many people have been practicing the monocropping of maize for many years. 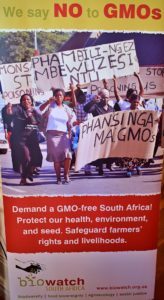 Maize is now often seen as the ‘only’ food, and even in years of good harvests, many farmers are only getting one food, from one food-group, giving us one set of nutrients. When most farmers in Malawi plant maize, they have been taught to make ridges in their fields. A typical maize field will consist of a repeating pattern of ridge-pathway-ridge. The ridges are planted with maize, and the rest of the land is left for pathways. Diversification is one of the greatest keys to successful Permaculture implementation. One of the ways that people can immediately start to get more food, is to eliminate ridges and move to a ‘bed‘ system. 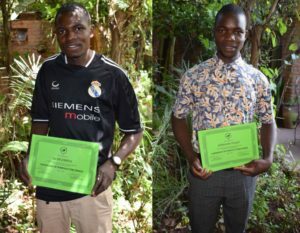 In Permaculture, many practitioners in Malawi are taking what used to be a ridge-pathway-ridge, and turning it into permanent one-meter beds. There are many advantages to do this. First of all, the current ridge-pathway-ridge system is only putting about 50% of land under cultivation for food, while the remaining 50% is being walked on. The ‘bed’ system puts 70% of land under cultivation, while only 30% is used for pathways. Maize can still be planted in beds, often down the edges, and then something else can be planted down the middle of the bed. The middle of the beds can be reached from either side of the bed and can be planted with nitrogen fixers to help the maize to grow better, or with foods like cassava and sweet potatoes which will mature later than maize (giving more access to food security throughout the year), or with groundcovers (such as pumpkins, gourds, or cucumbers) to help suppress weeds and hold moisture in the ground. 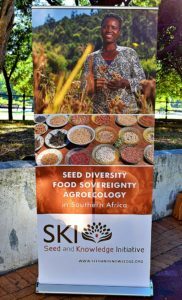 Diversity not only helps to increase nutrition security, but also helps to feed the soil, absorb and hold water, provides habitat for beneficial predators, and helps us to mimic the patterns of nature. In the current ridge-pathway-ridge system, the ground underneath the ridges is continually being compacted. Each consecutive planting season, the ridges are turned over. Meaning that this year’s pathway will be next year’s ridge. By doing this, farmers end up walking on their entire field. Over time, this causes the soil to become ‘hard-panned’. When heavy rains come, the water quickly runs off of these compacted pathways, causing flooding. And then, when there’s a gap in the rains for a week or two, the water has not been absorbed and held in the soil, so farmers quickly move into drought-like conditions. The permanent bed system helps to eliminate this compaction. Farmers no longer need to be walking on the areas being planted, which allows the natural processes of decomposition, ants, and worms to begin restoring the natural resilience to the soil. When heavy rains fall on these beds, every drop is absorbed and held for much longer. 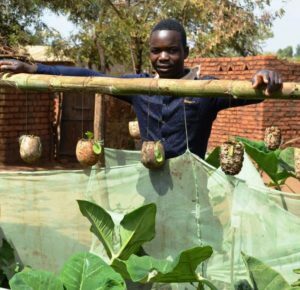 Diversifying crops also allows farmers to access more crops throughout the year from a wider range of Malawi’s 6-food groups. Solutions exist, be the change that you want to see in the world! The picture below shows the incredible difference that using the diversified permanent ‘bed’ system can make in years with erratic rainfall. Both of these pictures were taken on the same day during Malawi’s 2016 ‘drought’ which left an estimated 4 million people facing food insecurity. 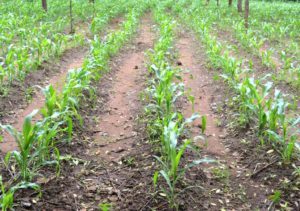 The picture on the left was a typical monocropped and ridged maize field, planted with hybrid seeds and chemical fertilizers. The field on the right was less than 100 meters away and received the exact same amount of rainfall. This field was planted using the ‘bed’ system with free open-pollinated seeds, diversified with nitrogen-fixers, groundcovers, and fed with organic manure. The results speak for themselves and show the incredible potential that every Malawian farmer has to increase food and nutrition security in the face of climate change. This is true ‘climate-smart’ agriculture! 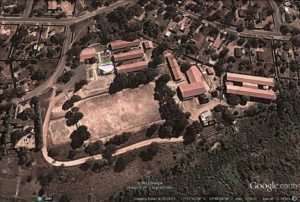 The second stage of implementing Permaculture at a school–Mapping. 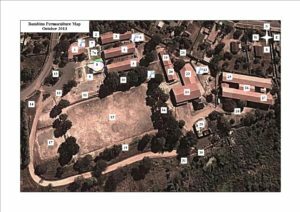 When this process of observation has been undertaken (it is never actually ‘completed’, as observation is a continual process even during the implementation process), the next phase is to make a ‘map’ of the site. This map should be a record of what is already existing on the site. Apart from the visible structures, don’t forget to take into consideration what is above and below (above may be electrical or telephone lines, and below may be water mains, gas lines, or underground cables). By mapping these existing resources to scale, it allows a good designer to then assess which areas can be improved in accordance with the needs trying to be met by the site. 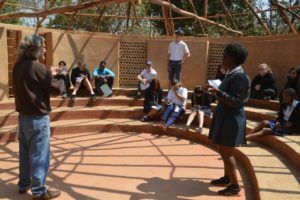 The third stage of implementing Permaculture at a school–Design. The third stage is the ‘design’. This is where the Designer begins to look at the site in terms of energy conservation. Through the use of Permaculture ‘Zones’, things that take more work can be located closer to the hubs of energy. For instance, if a home or classroom (Zone Zero) is using water for mopping, plants which like water can be located close to these sources. If there is a kitchen with left-over food scraps, things like compost bins, worm-farms, or kitchen gardens may be located in these areas (Zone One). The further away one moves from the sources of water and energy, the less water and energy should be required. In Zone Two, a designer may plan for orchards, small animal production, compost making, shade trees, windbreaks, etc. Zone Three becomes seasonal and rain-fed areas, where water-harvesting, staple foods, or larger animals may be located. Zone Four is generally comprised of managed woodlots and can be designed to meet the needs of fuel, building materials, income generation, animal grazing, fodder, food, bee-keeping, or even eco-tourism. Zone Five is the ‘forest’ where areas are allowed to regenerate naturally without much interference from humans. In agroecology, this is sometimes referred to as ‘rewilding’. 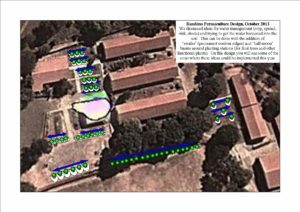 This process of observation, mapping, and design is the very same process that a person would use for a small home, a large farm, a community, or even a large urban area. The ‘Zones’ may be scaled up or down, but the thinking stays the same. On one site, a Permaculture Designer may identify or plan for multiple Zone Zeros, Ones, Twos, Threes, Fours, or Fives. Some Permaculture courses even teach about a ‘Zone Zero-Zero’, which is the human body. Without good nutrition, natural medicines, fresh air, clean water, etc., it is difficult for our bodies to implement the work required in the other Zones. So, the next time you hear somebody asking about setting up a Permaculture ‘garden’, ask them if they’ve taken into consideration the ‘whole picture’. Never Ending Food Manager, Peter Kaniye, describing Permaculture designs at his house. 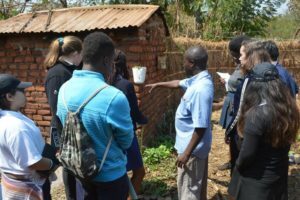 This week we had a visit to Never Ending Food by students from the Bishop Mackenzie International School (BMIS) in Lilongwe. These are all year-11 students who are doing an 8-week unit on sustainability. 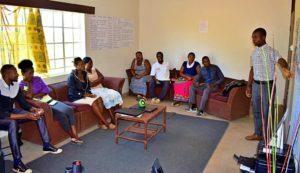 They will be developing projects for the eight weeks which focus on the theme of ‘sustainability’, and may include issues of climate change, agricultural production methods, food security, poverty reduction, nutrition, energy use, waste management, pollution, animal management, value-added products, water management, etc. Looking at Zone 3 transition ideas to make maize fields more nutritious and sustainable. During their visit to Never Ending Food, we tried to expose them to as many different solution-based ideas as possible. We are hoping that this gives them some inspiration for the creative designing of their school projects. 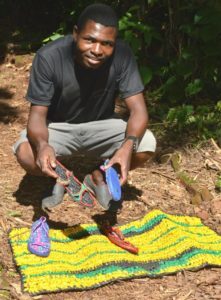 They were exposed to ideas such as worm farming, fish farming, water harvesting, diversified planting systems, natural medicines, sustainable building, organics, composting toilets, solar drying, and how to use the concepts of ‘guilds and zones’ for the creation of sustainable Permaculture designs. Making use of the brand new Permaculture Discovery Center! This was just the first of several visits which have been planned for the group. 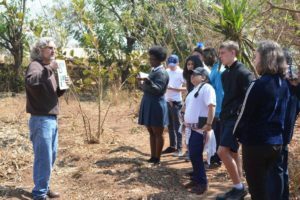 In addition to learning about Permaculture, they will also be visiting a bamboo farm which makes biochar, a farm practising conservation agriculture, and an industrial hemp project. This is just the first of three groups who will be visiting, and we wish them all the best in their continued studies!